Nida Sophasarun's poems refuse to sit still. The liveliness of her mind means that a household's collection of glasses are as worthy of her careful attention as exotic birds in far-flung places. The generosity of these poems means that her readers learn, in the grace of the poems' unfoldings, how the nonhuman elements in our worlds speak to the vulnerability of the individual who is looking for connection. Hers are lines you want to read slowly, out loud, delighting in the words as well as the twists and turns that they lead you through, because Nida Sophasarun is "telling you the truth / even if it's not all // completely true." 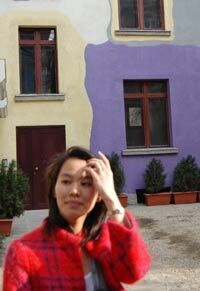 For more, read Apostrophe Cast's interview with Nida Sophasarun and visit her blog.